People will soon be able to read, work, watch movies and listen to music from gate to gate, but they still can’t talk on cellphones in flight. WASHINGTON – Airline passengers won’t have to “turn off all electronic devices” anymore — they’ll be able to read, work, play games, watch movies and listen to music from gate to gate under new guidelines from the Federal Aviation Administration. But they still can’t talk on their cellphones through the flight. Don’t expect the changes to happen immediately, FAA Administrator Michael Huerta said Thursday at a news conference announcing new rules. How fast will vary by airline. Delta and JetBlue said they would quickly submit plans to implement the new policy. Airlines will have to show the FAA that their airplanes meet the new guidelines and that they’ve updated their flight-crew training manuals, safety announcements and rules for stowing devices to reflect the new guidelines. Ketan Patel, 24, said he’s happy that regulators have debunked the idea that the devices pose a safety problem. “If it isn’t a problem, it should be allowed,” he said as he stepped into a security line, a smartphone in his hand. Currently, passengers are required to turn off their smartphones, tablets and other devices once a plane’s door closes. They’re not supposed to restart them until the planes reach 10,000 feet and the captain gives the go-ahead. Passengers are supposed to turn their devices off again as the plane descends to land and not restart them until it is on the ground. Under the new guidelines, airlines whose planes are properly protected from electronic interference may allow passengers to use the devices during takeoffs, landings and taxiing, the FAA said. Most new airliners and other planes that have been modified so that passengers can use Wi-Fi at higher altitudes are expected to meet the criteria. Passengers will also be able to connect to the Internet to surf, exchange emails, or download data below 10,000 feet if the plane has an installed Wi-Fi system, but not through cellular networks. Passengers will be told to switch their devices to airplane mode. Heavier devices such as laptops will continue to have to be stowed away because of concern they might injure someone if they go flying around the cabin. The guidelines reflect the evolution in types and prevalence of devices used by passengers over the past decade. In 2003, 70 percent of passengers carried electronic devices with them on planes, and the most common device was a cellphone that wasn’t capable of connecting to the Internet, followed by a calculator, according to a survey by the Consumer Electronics Association. A follow-up survey by the association this year found that 99 percent of passengers carry some device with them, with smartphones the most common followed by notebook or laptop computers. In-flight cellphone calls will continue to be prohibited. Regulatory authority over phone calls belongs to the Federal Communications Commission, not the FAA. 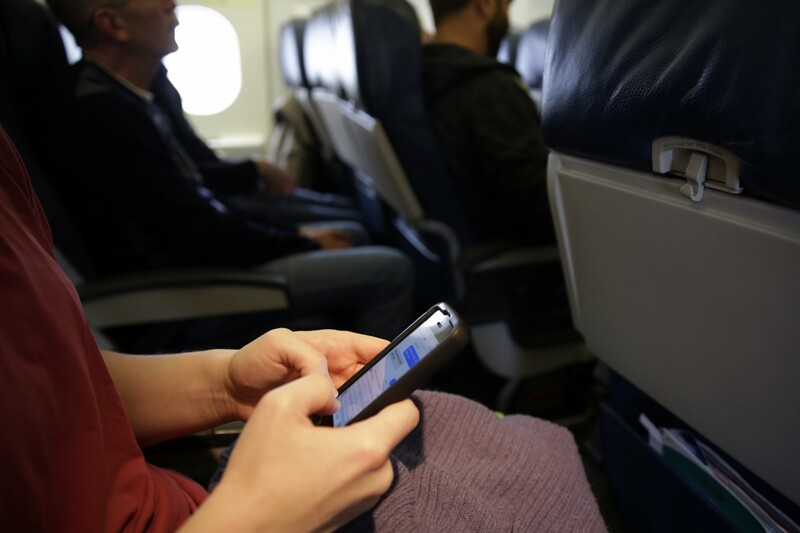 The commission prohibits the calls because of concern that phones on planes flying at hundreds of miles per hour could strain the ability of cellular networks to keep up as the devices keep trying to connect with cellphone towers, interfering with service to users on the ground. The changes announced Thursday apply to both domestic and international flights by U.S. carriers, but the rules get a little tricky for international flights. On takeoff from the United States and during landing back in the U.S., passengers would be allowed to use electronics. However, when arriving or departing a foreign country, passengers would have to comply with local laws. Currently, most counties have their own prohibitions on electronic device use. However, they tend to follow the FAA’s lead and likely could relax their own rules in the near future. An industry advisory committee created by the FAA to examine the issue recommended last month that the government permit greater use of personal electronic devices. Pressure has been building on the FAA to ease restrictions on their use. Critics of the restraints such as Sen. Claire McCaskill, D-Mo., say there is no valid safety reason for the prohibitions. Restrictions have also become more difficult to enforce as use of the devices has become ubiquitous. Some studies indicate as many as a third of passengers forget or ignore directions to turn off their devices. The FAA began restricting passengers’ use of electronic devices in 1966 in response to reports of interference with navigation and communications equipment when passengers began carrying FM radios, the high-tech gadgets of their day. A lot has changed since then. New airliners are far more reliant on electrical systems than previous generations of aircraft, but they are also designed and approved by the FAA to be resistant to electronic interference. Airlines are already offering Wi-Fi use at cruising altitudes on planes modified to be more resistant to interference. The vast majority of airliners should qualify for greater electronic device use under the new guidelines, Huerta said. In rare instances of landings during severe weather with low visibility, pilots may still order passengers to turn off devices because there is some evidence of potential interference with the use of instrument landing systems under those conditions, he said. Today’s electronic devices generally emit much lower power radio transmissions than previous generations of devices. E-readers, for example, emit only minimal transmissions when turning a page. But transmissions are stronger when devices are downloading or sending data. Among those pressing for a relaxation of restrictions on passengers’ use of the devices has been Amazon.com. In 2011, company officials loaded an airliner full of their Kindle e-readers and flew it around to test for problems but found none. A travel industry group welcomed the changes, calling them common-sense accommodations for a traveling public now bristling with technology. “We’re pleased the FAA recognizes that an enjoyable passenger experience is not incompatible with safety and security,” said Roger Dow, CEO of the U.S. Travel Association.